Every once in a while, somebody has a Really Great Idea. We always remember the big ones, like electric lighting, or the polio vaccine, or bacon. But Really Great Ideas don’t have to change the entire world to be great; they just have to change one little corner of it. Singularity&Co. probably won’t be profiled on Nightline anytime soon, but at its core the new small-press publisher is definitely founded on a Really Great Idea: getting older, out-of-print science fiction back into circulation, one book at a time. 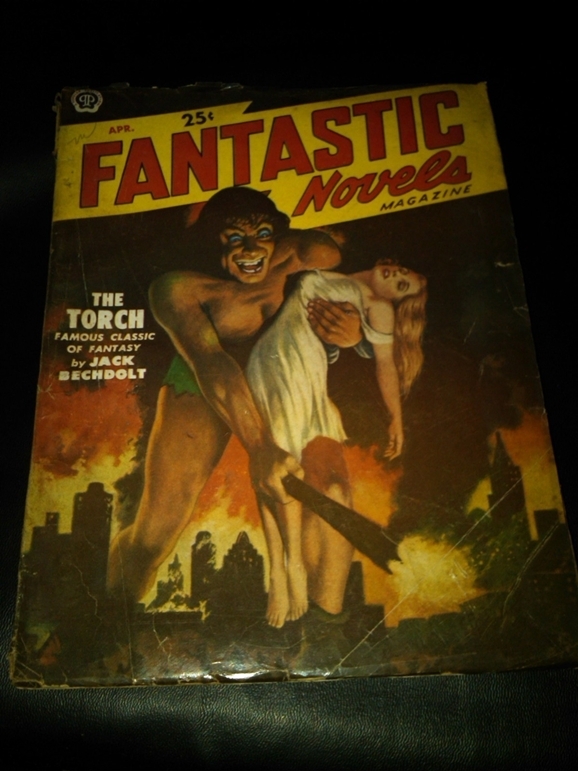 A copy of Jack Bechdolt’s “The Torch” for sale on eBay. And the even cooler part: you can help. Each month Singularity&Co. lets their subscribers vote to figure out which book should be their next target. They then work to track down the copyright holder, if possible, buy the rights, and then return that lost classic to the world in digital form. So, how does subscribing work? Singularity&Co. currently offers three tiers of subscription. A One-Year Membership costs $29.99 and gets you access to every book they publish for, well, one year. For $129.99 you can get a Lifetime Membership which means you’ll get “every book [they] save, ever, forever.” Finally, the big spenders can throw down $199.99 to join the Very Random Book of the Month Club. That’ll net you lifetime access to the e-books, plus they’ll send you one random hardcopy book in the mail each month. So far the company has “rescued” two vintage SF titles: Robert Cromie’s A Plunge Into Space and Jack Bechdolt’s The Torch. Haven’t heard of them? That’s kind of the point. Titles currently posted on their page for possible future publication include Roger Zelazny’s Damnation Alley, Poul Anderson’s Earthman Go Home, and Arthur C. Clarke’s Imperial Earth. Even if you don’t want to join, it’s worth skimming their rescue page just to see all the great old SF cover art. As for me, I think I can spare thirty bucks to help rescue some classic vintage science fiction from obscurity. You can find out more at Singularity&Co.’s website.